So, let’s get to it! Here’s the biggest way we are saving money on groceries. USE A LOCAL DEAL BLOGGER’S WEEKLY AD LIST TO PRICE MATCH AT WALMART. There are money saving/ bargain shopping bloggers all over that post a list every week of all the grocery store deals from the ads in the sunday paper. And Walmart will price match all those sales within 50 miles of the store. So, if you want to meal plan around what’s on sale, no longer do you have to flip through all the grocery store ads in the Sunday paper! In Omaha, I use Mom Saves Money. I just pull up her site when I make my grocery list. She lists 7-10 local stores’ ads’ sale prices. (Red = super duper sale price.) She posts this list every week and includes every store in the Omaha metro area. 2 pieces of paper to make your grocery list. 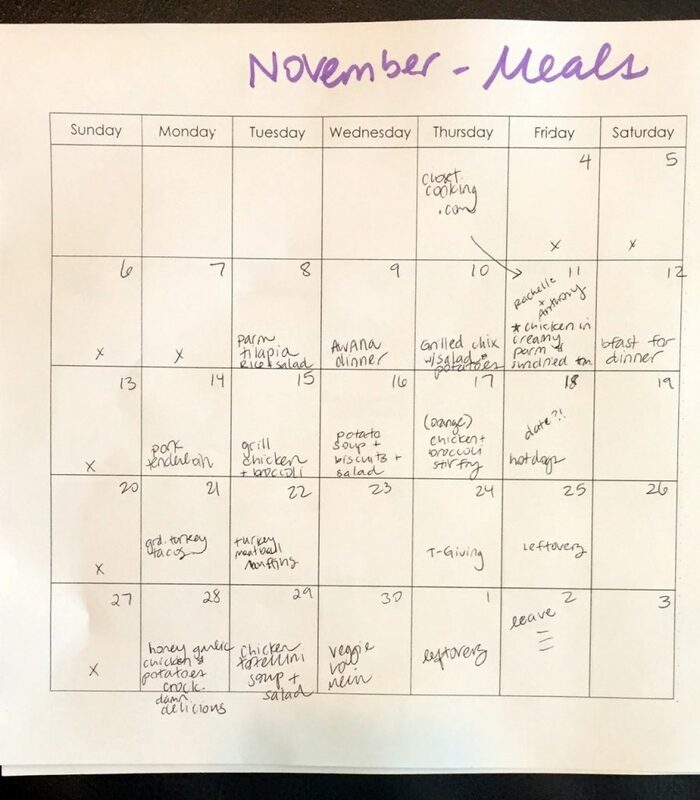 A meal planning calendar. Here are several I made that you can print for free. 1. Open the current week’s list and browse what’s on sale. Double check the dates! It stinks to make a whole price matching grocery list only to find out that was the wrong week… I know from experience. Walmart only matches exact brands and quantities. You can’t price match a Kroger brand item (or any other store’s generic brand) at Walmart because they don’t carry other store’s generic brands. Plus, Walmart’s generic brand is almost always as cheap as any other store’s sales on non-fresh food. Canned & boxed goods – canned tomatoes, cereals, broths for recipes, etc.. Regular milk & eggs – always cheapest at Aldi and Walmart anyway. 2. 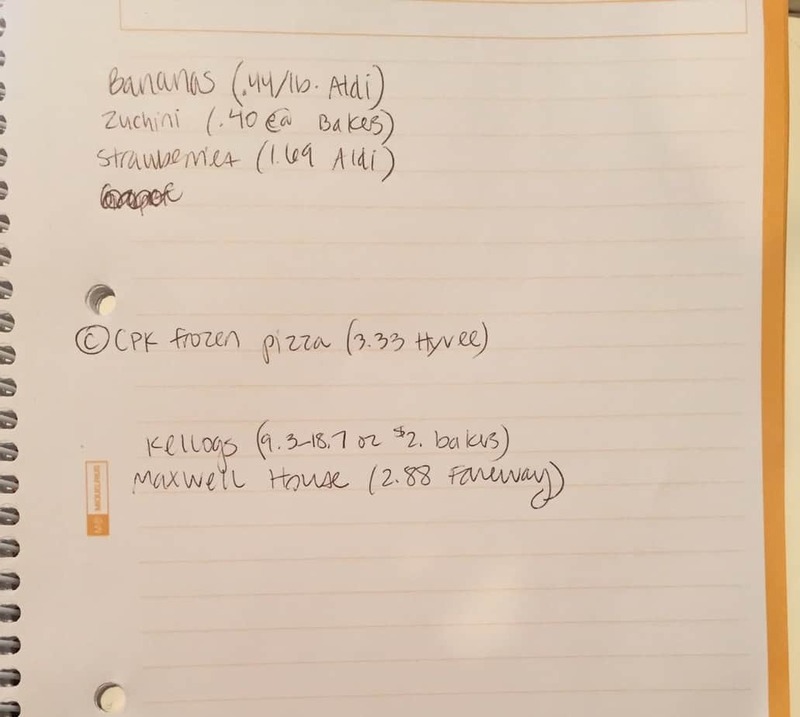 Jot down food items and sale prices/ locations on a piece of paper. This will become your grocery shopping list. Make sure to include quantities if specified. For example, Birdseye frozen vegetables come on sale every so often, and the ad list specifies “10-14 oz for .79/each.” I make a note of that on my list because you can’t price match a giant bag if the small bag is on sale. 3. Meal plan according to what’s on sale – here are some recipe ideas! Use one of these calendars to write down meal ideas from the sale list you just made. 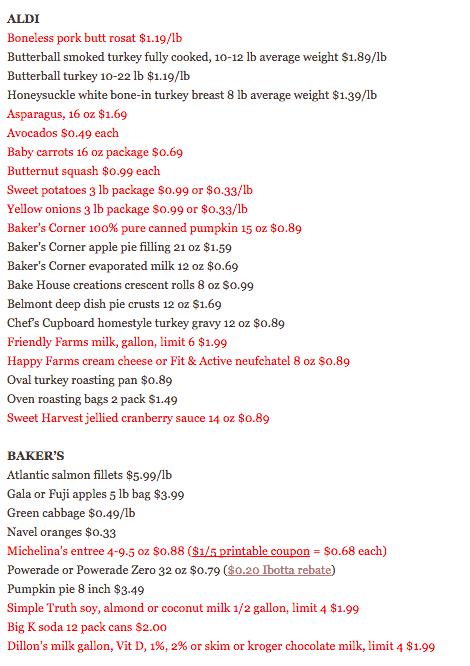 Sometimes I can glance at the sale list I just made and favorite meals come to mind that use those on-sale ingredients. If you keep doing this week in and week out, it will get easier to plan around what’s on sale. This website, Supercook.com, will suggest meals based on what you have and what’s on sale. If we’re having people over or I want to try a new and fun recipe, I’ll browse my Easy Weeknight Dinners pinterest board. 4. Don’t plan every single meal around what’s on sale. Ain’t nobody got time for that! Figure out how many dinners you’re going to meal plan for per week based on your schedule. If half of those are planned around what’s on sale, great. Once you start doing this regularly, you’ll find a rhythm that works for you. This is meant to help you save money and make your life easier, not stress you out! 5. As you meal plan, make sure to add extra ingredients to your grocery list. When you add a dinner to your list, glance over the ingredients required, and make sure you either have them all on hand or they’re already on your list. Every night, I would see something like “chicken in white wine sauce” on my meal-plan calendar and then spend 5 infuritating minutes trying to find the exact recipe I meal planned around. Was it on allrecipes.com or food.com? Or Pinterest? I don’t freaking know!!!! Seriously, this problem was raising my blood pressure. Then I realized – there’s this thing called a printer! Now, when I add a meal to the calendar, I print it off and stick it behind the meal planning calendar on the side of our fridge. I love cooking from a printed recipe! It is so much easier than using a recipe on my phone. No more phone turning off while I’m trying to read the instructions. If we love the meal, I save the paper. If not, I toss it. 7. If you are OCD, make a new list. By now, my list is super sloppy and the things I need to buy aren’t in the right order. I cannot get through Walmart with my kids & a disorganized list. I end up going back and forth all over the 27 aisles. So I always write my list in sections based on the layout of our store. Cans, cereal, broths, salad dressings, condiments, sauces, etc. Seriously, if something is in the wrong spot on my list, I will for sure forget it. When I rewrite my OCD list, I put the quantity, brand, price and store next to the item so that I can quickly and easily price match at checkout. COFFEE and cream!!!!!!!!!! THIS IS VERY IMPORTANT. I also check my magnetic pad on the fridge. If we run out of something or if I use the last bit of a random ingredient during the week, I write it down here. Otherwise I will for sure forget it. Walmart’s price matching policy is they will match any current exact product price for any store within 50 miles, no ad needed. I always say the price and store, but I don’t think you technically need the store name. Four times EVER in the last 4 years that I’ve been price matching, I’ve had an employee say the deal sounded too good to be true, and check the ad book that they have in the store. One of those times, I had accidentally grabbed the wrong size item. The other times, it just really was a great deal, and they honored it. Double check the size/ exact specs & write it on my list so that I don’t cheat the system. If the 20 oz bottle is on sale for $1.00, you can’t get the 30 oz bottle for $1.00. Put all the price matching items at the end and before they get to those items say, “I’d like to price match everything behind the lettuce,” or whatever. Be REALLY nice to the checker because it’s slightly more of a hassle for them. We should be nice to the cashiers anyway. I now recognize a few cashiers who have made price checking really easy, so I go to their line if they’re working when I’m there. If you have anything that is SO SO SO much less than regular value (like 75% or more), you might have that store’s mobile ad pulled up on your phone in case the cashier asks to see the ad. I never do this, but all those 4 times they had to look up the ad, I wished I just had it with me. Aldi is the cheapest for almost everything. If you shop there exclusively, that will be the cheapest. I used to think Aldi was gross and weird, but here’s why I changed my mind. Brand name salad dressing- we are salad dressing snobs. It’s weird, I know. Random things they don’t carry. What do you think? Do you price match? Does this sound like it’ll make price matching easier for you? p.s. In order to make this work for you, google something like “price match list blog [your city]” and see what comes up. Once you find a good site, flag, favorite, or bookmark it, then get in the habit of checking it as you make your list. If you find or use another site in one of those cities, or a different city, let me know in the comments and I’ll add it to this list for other readers’ convenience! You’re welcome, Marcie!! Glad you stopped by. Have you googled it? I haven’t found a Charlotte area price matchers list yet – looking though!! I’ll post it if I do. Also, Jennifer – smart on sale price meat buys 🙂 I just did that yesterday! Come back and share if you do end up finding a price match list for your area! I’ll keep looking too. I’m in Charlotte, too. Have you had any luck finding a local price matcher blog? If so, could you please share the info? I would really appreciate it! Thank you so much for sharing! This definitely makes sense. I haven’t tried price matching so I’ll need to start that. Any chance you could find a Charlotte, NC price matcher blog? One of the ways that I save money on groceries is anytime I go to Food Lion (kind of like Hy-Vee but not as many options) is I walk past their meat dept. If something is a really good sale or on mark down because it’s about to go out of date, I buy it and either cook with it that day/next day or freeze it as soon as I get home. I have bought a spiral ham for $5 and a pack of chicken quarters for <$3 as well as many other deals. I frequently have coupons from their store machine (like "$5 off $20 of [insert type of meat]") or occasionally a manufacturer coupon for something in the meat dept. ooo thanks for the tip! I’ll check it out 🙂 Glad you found some stores and strategies that work. Awesome thank you! And yes we have a Walmart close by as well as an HEB(Texas chain grocery store). I’m still learning about HEB and their store policies. They have good prices on some things and some not so great, my price book is definitely coming in handy trying to figure out which stores are best! I wanted to say that I found an awesome app that’s free and has all your local store ads. It’s not perfect, but definitely super helpful!! It’s called Grocery Pal and it is in the app store. Do you have a close-ish walmart to price match at? I empathize about Aldi. I love living close to one – it stunk when we lived without one! Hi new here and I so want to do this! I just moved to San Antonio though and can’t find any good sites, and it’s so big and overwhelming! Where I moved from had an aldi and I LOVED it! The only one I know of is Deals to Meals, but it costs $5/mo. That’s not much, but since we’re saving for a house we’ve cut all our ‘extras’ out of the budget. woah that is sneaky! 🙁 so what are some good grocery saving tips for shoppers in Australia (or your area, at least)…? Ha! Where I live (Australia) the stores will only price match the exact same item; and then they get the manufacturer to make it slightly different for their store. There are two big grocery stores that have the bulk of the market so manufacturers comply. “Oh, did you want the 100 gram bottle of This Brand sauce? So sorry, we only carry it in 110 grams, so no, we can’t price match.” So they get to put it up in big letters – “Look at us! We price match! We’re wonderful!” and then make it completely obsolete by not actually having any of the same items. Sneaky little buggers. We actually lived in Cambridge for a year and I shopped at the Market Basket in Somerville.I had no idea there was an Aldi near there too!! 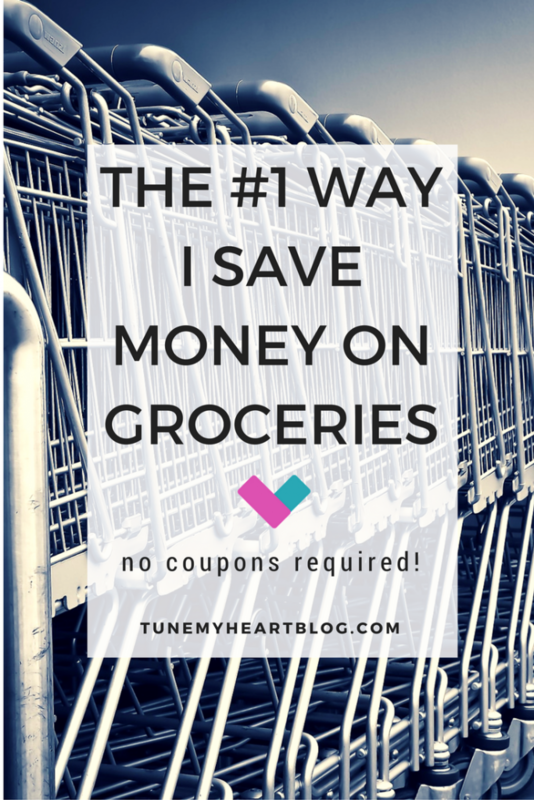 I’m pretty sure Aldi would be cheaper 🙂 Plus I like shopping at Aldi better than I did at Market Basket – did you read my post about all the reasons I love aldi? haha maybe I’m a little overboard about it but it’s SUCH an easy shopping experience and I would guess it’s cheaper than Market Basket too – would love to hear about what you think! Never heard of Aldi before but looked and there’s one about 3miles from me. I also just started going to a new WalMart that opened near me in Boston, so I will try the price-matching. I typically get my groceries at Market Basket. My question is do you think that Aldi is even cheaper than Market Basket?? Or have you never shopped there before? That’s the grocery store with the reputation for being the least expensive….but just learning about Aldi now. I’ll check it out! Pam, so glad you find these ideas helpful. Thanks for reading! I’m not sure! Some of our local stores have price matching and the guidelines are just narrower 🙂 worth asking about! This is one grocery tip I have never used, but I don’t shop at Walmart. I wonder if any other stores would price match like they do? Hi Gabi! Check out the comments on this post – someone else from Houston asked for sites so I found several. They’re all listed in response to Debbie’s Comment 🙂 Hope that helps! Hi I came across your post its super helpful! If you have any pages for Houston please send them my way! Thank you! Here’s one: http://www.couponkristin.com/houston-coupon-matchups/ She doesn’t have a list of all the sales from all the stores, like I showed in my post, but she does have the coupon matchups with sales for each store. Meaning, she lists all the items on sale that also have a coupon. Not quite as helpful if you don’t really want to coupon… but still better than nothing. Finally, https://www.mygrocerydeals.com/ you have to create a free account but it compiles deals and you can filter your search (like, searching for deals in just baking items, or just dairy, etc…) Plus it allows you to save items to a list in your account. I wonder if there’s an app for this site too? I haven’t spent much time on it but it looks pretty cool and will search deals by location! Hope one of these works for you, Debbie! Good luck! Hi, thanks for sharing. I have been looking around to save money on groceries bcos of the peculiarities of my income for now. Im in houston Texas. Any idea of any local blogger who will send out information so I can benefit? BTW – First time reader and I’m loving your site! Your social share links were not working for me when I clicked on them follow you. I really look forward to reading more posts. Love this. Need a Texas one. Love these tips! Thank you so much for sharing! yes! let me know when you do! This is a great tip! Hopefully I can find someone out here in Virginia! Thanks, Renee! These are great ideas!!! As a retired couple on a fixed income, these options sound outstanding!! Thanks! !